Running for over 5 years 'The VFX Festival' is the UK’s leading animation & VFX conference. This year it took place from the 6th - 8th February at Rix Mix cinema in Shoreditch, London. It hosts industry leaders in animation and VFX from all over the world. Bringing everyone together allows a sharing of knowledge with both industry veterans and emerging talent. It provides an opportunity to learn from the best along with recruitment panels to help artists get their foot in the door. Our Stoke-on-Trent based studio made it's debut at the London festival as Daniel Waterman was invited to speak on a panel about VFX Producing. As Carse & Waterman's Company Director and Producer he was well equipped for any questions. 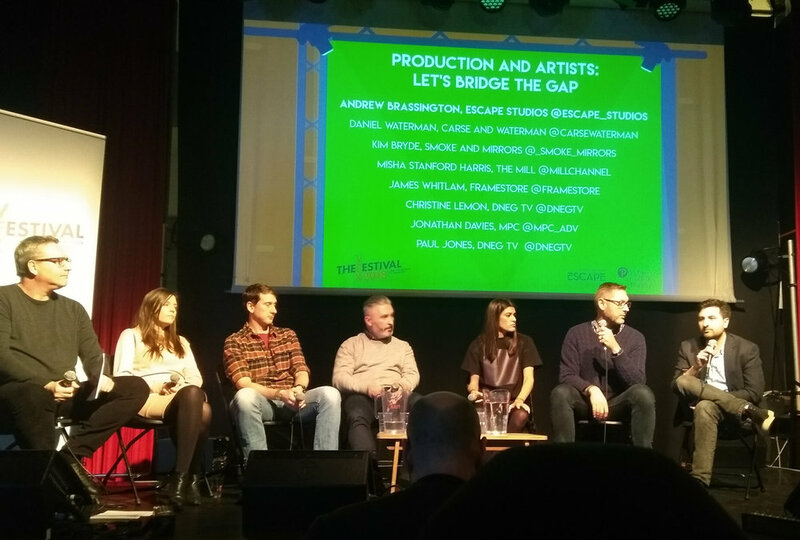 Titled 'Production and Artists: Let’s Bridge the Gap', the panel saw Daniel alongside producers from some of London’s biggest VFX companies. The lineup consisted of 'Double Negative', 'Framestore', 'The Mill', 'Smoke & Mirrors', 'Moving Picture Company' and of course 'Carse & Waterman Productions'. In front of an audience of around 50 keen VFX producers and artists, the panel discussed the many challenges of being a producer and how best to work with artists in order to harness their creativity effectively.